FIFA had invited the team to the World Cup final on Sunday but the governing body announced the boys wouldn’t be able to attend since they are receiving medical treatment after their ordeal. France will face the winner of Wednesday’s semifinal between England and Croatia in the World Cup decider in Moscow on Sunday. 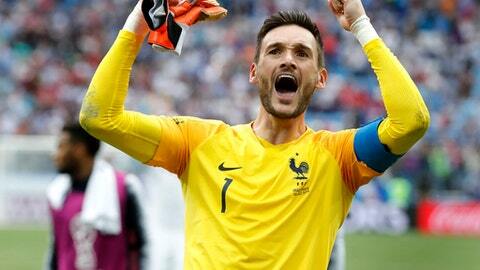 The French public, celebrities and politicians have rallied around the national team as it advanced. Umtiti rose brilliantly to head in Antoine Griezmann’s corner from the right in the 51st minute, for his first goal of the tournament. The winner in St. Petersburg plays Croatia or England in Sunday’s final. It’s 0-0 at halftime in the World Cup semifinal despite Belgium and France going close to scoring in the first half. With France’s soccer-loving President Emmanuel Macron and Belgian King Philippe watching from the stands, France sat back and hoped to hit Belgium on the counterattack. French teenager Kylian Mbappe’s pace was a constant threat on the right and his pass in the 40th�minute set up Benjamin Pavard but Belgian keeper Thibaut Courtois stuck out a left leg to deflect the shot wide. Mick Jagger is on FIFA’s list of VIP guests at the World Cup semifinal between France and Belgium in St. Petersburg. The Rolling Stones singer completed the band’s world tour on Sunday in Poland. Among the political leaders joining Jagger in the crowd as official are Hungary’s Prime Minister Viktor Orban and Ali Bongo Ondimba, the President of Gabon. France coach Didier Deschamps warmly hugged Thierry Henry moments before the start. Henry is France’s all-time leading scorer with 51 goals, but is now an assistant to Belgium coach Robert Martinez. Henry also greeted players on France’s bench. The winner between France and Belgium will meet Croatia or England in Sunday’s final. Belgium is hoping to reach only the second major final, having lost the European final to West Germany in 1980. Belgium lost its only previous World Cup semifinal to an Argentina in ’86. Mexico went home from the World Cup more than a week ago, and while its fans are still scattered around Russia, some of them have lost enough interest in the matches that they’re selling tickets at face value. Several fans wearing Mexico’s green jerseys approached a larger group of Belgians at a beer garden in St. Petersburg offering seats at ”FIFA prices” for the World Cup semifinal. They didn’t immediately find any takers among the festive Europeans, who apparently already were set for the Belgium-France match. Mexican and South American fans came to Russia in huge numbers despite having to travel far greater distances than Europeans. They’re still everywhere in the semifinal cities of St. Petersburg and Moscow even though only teams still alive are from Europe. Martinez has been forced to reshuffle his back line after Paris Saint-Germain wing back Meunier was suspended for the match in St. Petersburg after picking up his second yellow card of the tournament in Belgium’s 2-1 quarterfinal win over Brazil. Dembele’s inclusion was the only change to the Belgium team that beat Brazil 2-1 in the quarterfinals. Veteran striker Olivier Giroud hasn’t scored yet in the tournament but needs one goal to move ahead of Zinedine Zidane into outright fourth spot on France’s all-time list. Giroud keeps his place in a forward line featuring 19-year-old sensation Kylian Mbappe and Antoine Griezmann. Thousands more England fans are expected to descend on Moscow for their first World Cup semifinal in 28 years, but there’s not much sign of them yet. Airlines have offered extra places on flights to Moscow and some Russians have sold their tickets after their team lost to Croatia. Still, Miles says high prices ”have put a lot of people off” who were thinking of traveling at short notice. England manager Gareth Southgate has been surprised at the vest craze back home, where ”Waistcoast Wednesday” is trending. FOX Sports says it will be simulcasting the World Cup semifinal between France and Belgium on Silvercast’s high-definition screen known as ”Mega-Zilla” in New York’s Times Square. The ”Mega-Zilla,” a 78-foot-by-330-foot (24×100-meter) screen being promoted as the largest TV screen in the world, will be located between 45th and 46th Street on Broadway in Manhattan. France and Belgium will be playing for a spot in Sunday’s final in Moscow. The sport’s world governing body says it has been informed by Thai authorities that the 12 boys and their coach ”will not be in a position to travel” for health reasons. FIFA leaders will meet with Thai soccer officials this weekend in Moscow to explore ”a new opportunity” to invite the boys to a major event to celebrate their survival. FIFA expressed ”profound gratitude to all persons involved in the rescue operation,” and condolences for the family of the diver who died. They’re getting the World Cup croissants ready in Paris. Soccer’s international governing body has fined Ognjen Vukojevic 15,000 Swiss francs ($15,150) for ”unsporting behavior” after he and Croatia defender Domagoj Vida recorded a video including the phrase ”glory to Ukraine” after the team beat host nation Russia in the World Cup quarterfinals. The Croatia soccer federation has already removed Vukojevic from its World Cup delegation. Vida was let off with an official warning and no match sanction, leaving him available to play in Wednesday’s World Cup semifinal against England. The World Cup semifinal stage is beginning with the all-European lineup being celebrated by soccer’s governing body on the continent.